The survival of koalas in the south east forests of NSW is in the balance. Koalas on the NSW Far South Coast used to inhabit the forests but were hunted in the thousands for a fur trade. This koala was spotted at Bermagui in 2010. Koala Code of Practice: Forest Harvesting in New South Wales December 2014 states: "If a Koala suffers fatal injuries, a Koala care group should be contacted so it can be taken to a veterinary hospital for a post mortem examination". Koalas have the same charismatic importance and symbolism as pandas and polar bears. They are an ‘iconic umbrella species’ whose habitat also protects the resilience of thousands of other forest dwellers sharing their diverse natural ecosystems. Our last remnant population of fewer than 70 vulnerable koalas struggle to survive in southeast State Forests which are still being logged. State Forests comprise over 400,000 hectares of prime carbon koala forests in south east NSW. Translocation of koalas at risk from logging in South Gippsland will start soon. These koalas are being released into tree species now protected within the NSW South East Forest National Park. These same koala habitat tree species are not re-growing naturally after logging and expensive extensive restoration is required. The GSF proposal also responds to the Australian Government which upgraded the koalas’ (phascolarctos cinereus) status to ‘vulnerable’ under national environmental law. This is commendable, yet they struggle to survive in some parts of Australia. Koala Population Estimates and Areas Necessary for Protection. Koalas used to roam in their millions in south east NSW. Their numbers have dwindled almost to zero population. Now all known Koala populations in south east NSW occur at low to very low densities, sometimes in forests growing in rugged terrain and with dense canopy, making it difficult to assess Koala numbers. Given the limited data currently available these figures should be seen as indicative. Estimating Koala Populations and Trends in South Eastern NSW. 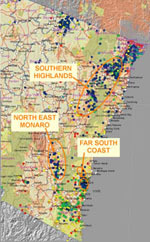 Link to a map which shows the three main locations of koalas on the south coast of NSW. Whilst all are threatened by human interference and natural occurrences, the koalas on the far south coast are most sparse and are by far the most highly threatened. 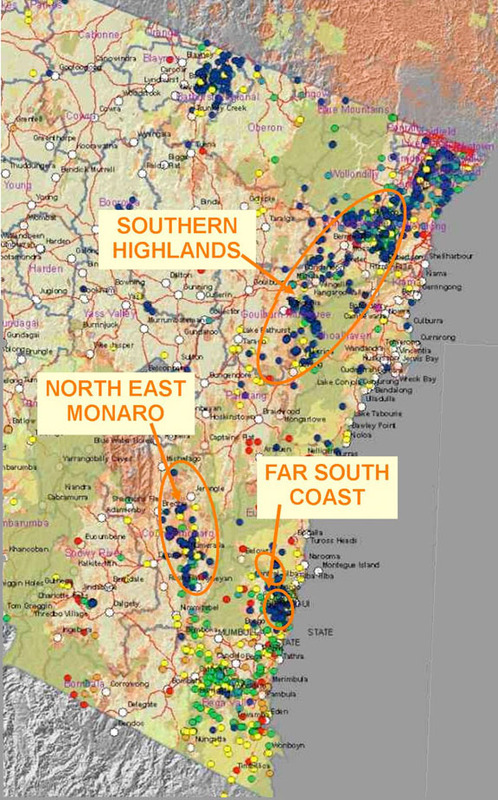 This map shows koala records in south east NSW, colour-coded by decade, and approximate boundaries of the three known koala populations. 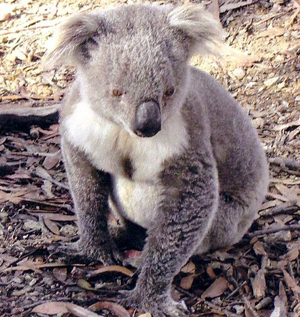 Anomalies exist between State and Commonwealth koala protection laws. Conservation advice from the Department of Environment and Heritage for local councils, government agencies and non-government organisations, is for the protection of koalas on a regional level. It includes the recommendation to protect areas containing koala populations or which could support them in the future. It stated that any development or project activity that is deemed to have an unacceptable impact on the Environmental Protection and Biodiversity Conservation Act-listed koala populations would not be approved under national environment law. For example, the remnant unique koalas in southeast forests remain at risk. The forests of Bermagui, Murrah, and Mumbulla were logged despite having known koala habitats. Tanja State forest was about to be logged until a Forest Officer saw a koala and surveys found a small colony. Logging rules do not protect koalas: native forest logging prescriptions are ineffective and spell the death knell for these koalas plus other species inhabiting logging coups. Thus, State Forests are minefields for koalas, potoroos, powerful owls, swift parrots, black cockatoos, sugar gliders, wombats and any other wildlife living within their boundaries.